Wonderful modified Terrace A-frame home sitting on nearly 200′ lake front with gorgeous view of lake, 3+ car detached garage with 30′ depth. Very nice 3 season room. Large walk around deck on main level with patio below. Dock with slide, 2 woodturning fireplace/stoves. Master bath with walk-in closets, skylights throughout. Geo-thermal heating and cooling. Plus much more! Please, send me more information on this property: MLS# PA1203701 – $425,000 – 124 Lakeside, Dahinda, IL 61428. 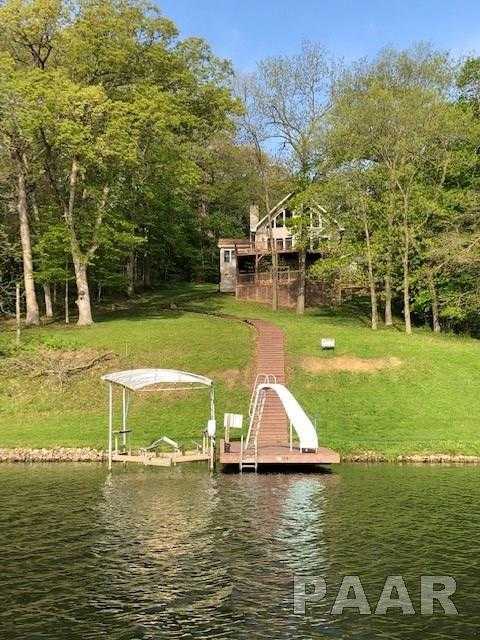 I would like to schedule a showing appointment for this property: MLS# PA1203701 – $425,000 – 124 Lakeside, Dahinda, IL 61428.